Neither of these players are exciting, but Dickerson fills a LF need for WBFD and my pitching staff has a low floor for innings pitched, so Volquez seemed like a cheap way of helping out there. Dating back five years, Volquez has averaged more than 187 innings per season. Here are his fantasy points per start each of those years: 18.13, 26.4, 26.33, 18.23, 25.03. Pretty boring stuff. If I can get the guy who was a league average starter three of five years for $9, I’ll be content. I think there’s plenty of surplus value in an average pitcher for $9. I also think moving to the National League and pitching in Marlins Park help him get to that average level. Plus, he’s really the only proven durable guy on the Marlins’ staff, so he’s likely to be the default “number one starter” type guy who gets asked to soak up extra innings. Steamer projects Volquez at 25.36 points per start this year and Fantrax, whose projections you shouldn’t buy into, peg him at 24.28. For his purposes, acceptable all around. FYI, Steamer has Dickerson at 4.84 points per game and 672.7 points total, which is respectable. Fantrax has him at 4.73/695.5. I grew tired of his $12 salary and inability to hit lefties (.259 wOBA) or on the road (.271 wOBA), but if he actually hits those totals, $12 is perfectly fine. I think both of these players were probably facing good odds of being cut. Given their cost and volatility, there’s still probably a chance WBFD and I end up changing our minds two months from now and dumping them. But by swapping teams, their odds of getting cut probably went down a bit. 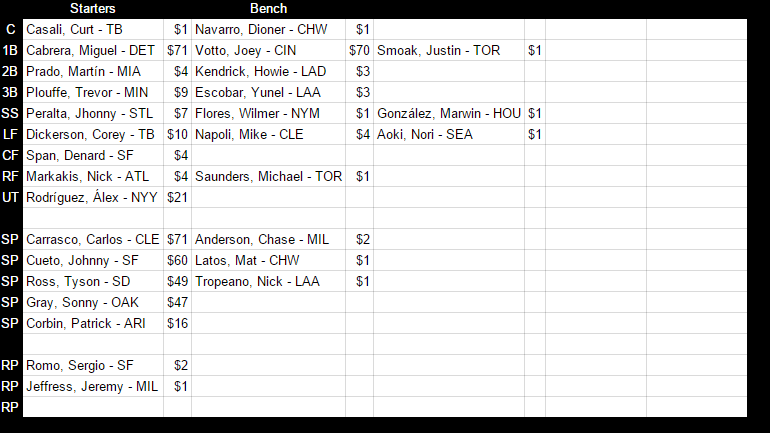 Jordan’s thoughts: I’d rather have any SP who might be useful for under $10, than lots of things. I don’t think Corey Dickerson is a bad pickup, he might be better next year, might not. I think this trade is fine for both sides honestly. As Andrew said above, both players were not far from the chopping block, but they’re more useful to the other team. It’s a valuable swap in that way.